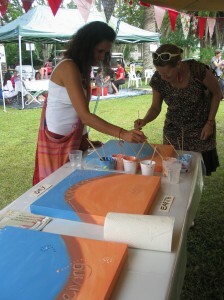 These three canvases where painted by women at the red tent festival 2012. 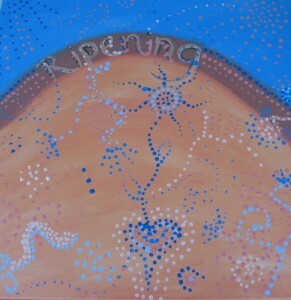 The theme of the painting was finding balance between mother earth and father sky, between receiving and giving, listening and creating, connecting our left and right brain. 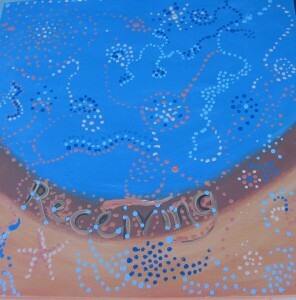 I prepared the canvases and provided an open table for anyone who wanted to stop for a moment and participate. It was an invitation to paint and connect with each. 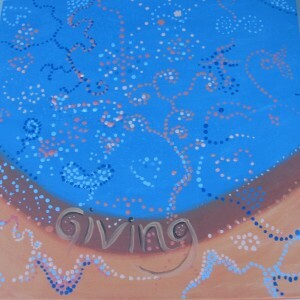 I asked women to add dotts of different colours with an open and curious mind, letting the images emerge. Due to it’s simple form of expression everyone felt able to participate. Adding little dotts one at a time invites us to slow down finding balance between relaxing and creating. This process invits to experience the theme of the painting. Women expressed that the process had a meditative quality and they all enjoyed the process of slowing down. Nearby there was a basket weaving area which had a similar flavour to it….women gathering creating and connecting, something women have been doing for tousands of years. The peace and connectedness was enjoyed by all women on that wonderful festival. There were workshops on offer all day and stalls selling products and serives aimed to nurture and support mothers and women of all ages. I also offered a three hour workshop on self nurture. 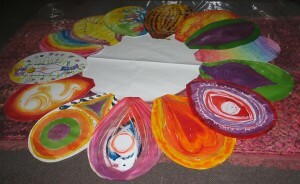 At the end each woman created a flower pedal to create one beautiful flower representing our time of nurture together. At the least it’s more informative than one of those reality Television stars, kim this? Inside the top five of my favourite posts, thanks!